One day at the pool, the inevitable happens: you get thrown into the water by a bunch of your drunken buddies. In any case, the $300 cell phone that was in your pocket got wet. Unless you own a water proof cell phone, you’ll want to know exactly how to dry out a wet cell phone, because you might still be able to repair it. 1. Remove the battery. This is the most important part! Damage in wet electronic devices mostly comes from short circuits. Removing the battery quickly will prevent electricity from further damaging the phone. Resist the temptation to test the phone while it is still wet! 2. Remove the SIM card (if applicable). The SIM card should have survived, but make sure you don’t use it again until it has dried completely. 3. Disassemble the phone. Use the required screwdrivers to disassemble the phone as much as you can. Note that disassembling the phone will probably void your warranty, but then so will dropping the phone in water. You’ve got nothing to lose. The reason for the disassembly is simple: the phone will dry up much faster once it is disassembled. You could skip this step, but water can remain inside the phone for weeks if you don’t do it. Heat the phone. Heat will help water evaporate. Leaving the phone under a desk lamp for 24 or 48 hours might help. WARNING: Do not overheat! Just a little warmth is enough. Heating the phone too much can further increase the damage done to it. Use a fan. Leave the phone under a desk fan for 24 or 48 hours. 5. Test the phone. After a few days (usually two or three), the phone should be clean and dry. Reassemble the phone and put the SIM card and battery pack back in. If it doesn’t work, there is a chance your battery has died from water damage. Try an alternative power source. You can get another battery for cheap if your phone still works. As always, be very careful when disassembling electronic devices. Know you warranties and insurances well before attempting anything, and make sure you note how to reassemble the phone. Repair a wet cell phone at your own risks. 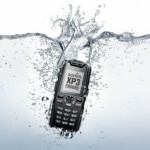 Hopefully, you will manage to save your wet cell phone from drowning! You can also put the phone in a substance that will absorb the water. I managed to rescue my wife’s Nokia phone after she accidentally dunked it in water. I accidently drowned my N-gage to the water for nearly a second. I took it out, rub it with tissues. I thought it was okay. Everthing seemed fine. Then, suddenly I lost my signals, which rarely happens in my area. Plus, the phone didn’t even say that it couldn’t register my SIM card. What’s worst, the power button didn’t work, no matter how many times or how strong I pressed it. So, I took out the battery. I removed everything, the battery, case, SIM card, mem. card and I used hairdryer to try to dry the phone. AND. What’s weird, as I inserted my battery, the phone turned on by itself. Yet, the power button wasnt still working and so as the SIM card. I removed everything again, but this time I inserted a SIM card from another country which wouldn’t work here. This time, the phone said that it couldn’t register the SIM card. I inserted my original SIM card to another phone and it worked well. So what’s wrong with my phone??! I really don’t know what to do. Please help! I beg you. i fell into a pool one day and my Samsung SGH-U900 SOUL was damged all over on the touch pad can i fix it ? it also doesnt come back on and the cameras flash stays on what is up with it? Next post: CDMA vs. GSM, Which One Is the Best for You?